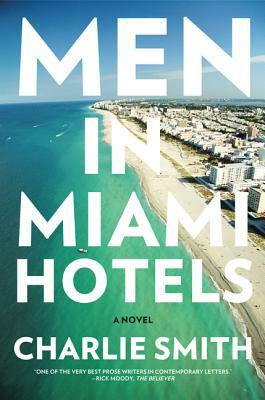 In Men in Miami Hotels, Smith tells the story of Cot Sims, a listing Miami gangster who returns to Key West aiming to—among other things—save his fool-proof mother from homelessness after a recent hurricane. For love, for cash, and for the hell of it, he snatches a trove of emeralds that his boss, the relentlessly vicious Albertson, keeps hidden on a small island. And then trouble, which has been coiling around him for years like a snake, bites. Cot has forty-eight hours to return the emeralds before items of equal or greater value—namely, the lives of everyone he loves—are repossessed by Albertson and his army of hired gunmen. Fleeing across the Caribbean, Cot blazes a trail of survival, skeltering between the narrowing walls of fate. Charlie Smith has been called a novelist of "appalling brilliance" on the cover of the New York Times Book Review. Critics have praised his work with the fervor of converts. And his prose, as radiant and dynamic as it has ever been, "lands him in the ranks of America's greatest contemporary fiction writers" (Houston Chronicle). Charlie Smith is the author of eight novels and eight books of poetry. He has won numerous awards, grants, and fellowships, including the Aga Khan Prize, the Levinson Prize, the J. Howard and Barbara M. J. Wood Prize, a Guggenheim Fellowship, and a grant from the National Endowment for the Arts. His writing has appeared in numerous publications, including the New Yorker, the Paris Review, and the New York Times. Five of his books have been named as New York Times Notable Books of the Year or as Editors’ Choices. He lives in New York City.